Sherry FitzGerald welcomes Pollinore, Cummer, Corofin, to the market for sale by private treaty. This is a large, bright, Hamptons-style detached home. Originally constructed in 2005, the property has only recently been completely finished by the current owners and offers an abundance of space totalling approximately 336sq m (3,617sq ft ). The property boasts many distinct features with extra high ceilings, decorative door architraves, excellent proportions, and spectacular entertaining spaces throughout. The accommodation includes large open two storey entrance with a sweeping balcony that lends itself to grand-scale entertaining that immediately portrays the quality of this home. The kitchen/dining room spans the depth of the property with sitting room, living room, and two bedrooms, both complete with en suites and one walk-in wardrobe, completing the ground floor accommodation. There are a further three bedrooms on the first floor with two en suites and a home cinema room for cosy family movie nights. Asking price is €397,000. The gardens are landscaped on a circa 0.69-acre site (0.28ha ) with lawns to front — rear to be grassed prior to sale. 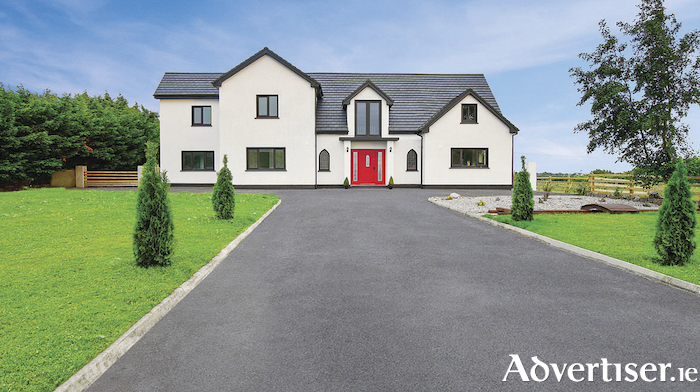 Although this home has been designed for comfort and privacy, it is located six minutes from the ever popular village of Corofin, a short walk to Cummer national school, 13 minutes to Claregalway, and only 30 minutes from Galway city centre, and 50 minutes from Shannon and Knock airports. Overall this is a wonderful family home offering the best of Galway. An early viewing is highly recommended. Please note that some of the images have been staged for illustrative purposes.